Gelato is traditionally served at a warmer temperature than ice cream, which makes it silkier and smoother. Because it has a lower fat content than ice cream, the main flavor can really shine through. 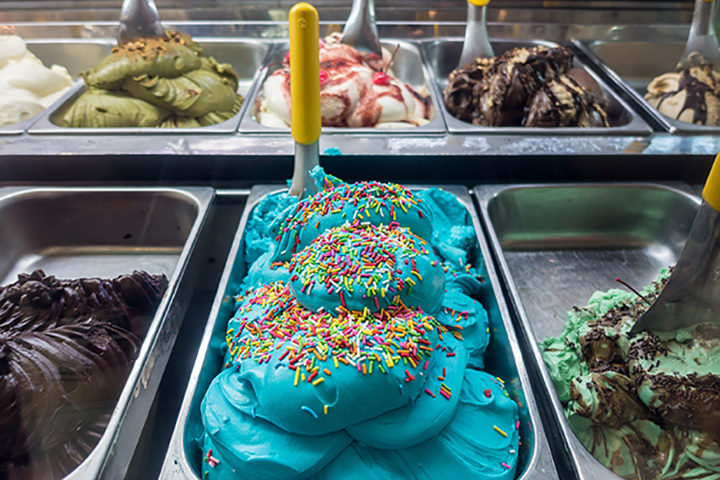 If you’ve never had this Italian delicacy, take time this summer to check out some of these great places in Oklahoma that serve up gelato. If you walk by Omega Chocolate when it’s closed, you can still see the gelato through the window and drool over the delightful flavors. They have an extensive flavor list that rotates. The white chocolate cherry cheesecake is awesome. Stop in Penn Square Mall and check out this gelato shop that says, “More flavor. Less fat.” According to their website, gelato has 70 percent less fat than ice cream. The name Pacuigo means “messy concoction.” It’s a great place to enjoy an Italian experience. Gelato at this shop local to OU is made with the finest products, such as real fruit and hormone-free cow’s milk. Il Dolce Gelato also offers sorbet, which is fat-free. These frozen desserts are handcrafted on site in small batches to ensure quality and taste. Bricktown Candy Co. offers gelato when you’re visiting downtown Oklahoma City. The staff is among the most friendly you will ever encounter! Watch their Facebook page for updates on flavors. This shop makes specialty flavors of gelato and does custom orders. Try everything from salted caramel gelato to gelato inspired by Girl Scout cookies. Yum! The pizza is awesome, but you’ll want to save room for gelato for dessert. Read any reviews online and you’ll find that there’s no better way to end your meal than with Firo’s excellent gelato. Gelato is made fresh daily in small batches. They always have seasonal favorites and few dairy-free flavors which are generally very low in fat. A downtown European-style café with gelato and coffee. Gelato is hand-crafted in small batches, and they warn you that when a flavor is gone, it’s gone. It’s on the ground floor of Devon Energy Center. Homemade gelato, craft coffee and pastries. What more could a person need for an afternoon pick-me-up? Blue Spruce comes highly recommended across the board.